I'm in the process of writing up a post on my university intranet blog about how I'm addicted to information and some of the tools I use to help me with it, but I figured this particular feature on this particular service was worthy of its own post. Brace yourself: I've finally made the switch from Bloglines to Google Reader! While I still think Bloglines has a marginally better interface, and the Bloglines Beta looks promising, I'm really sold on Google Reader's Shared Items system. 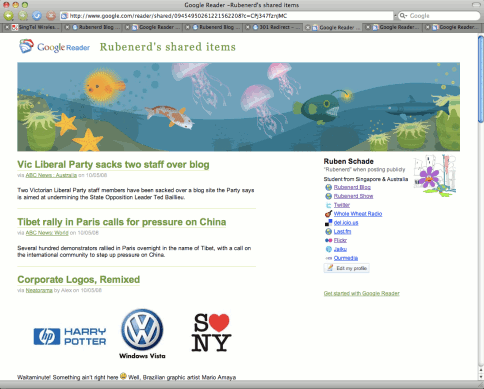 One particularly important feature they added recently was the ability to change the style of your Shared Items page. Mine now includes a cute fish tank in the header, very useful.